Tobacco from Colombia has been used as filler in major brands for years. Big names like CAO, Alec Bradley, and others have used a leaf here and a leaf there to grace their blends with a touch of the exotic and add a nuance that can’t be found in more common varieties of cigar tobacco. But Colombian puros are another matter. To my knowledge Route 45 Cigars is now the only American company importing cigars made exclusively from Colombian grown leaf, and based on the quality of this tobacco I think they will find their niche in the U.S. cigar market soon enough. Route 45 produces Colombian puros under the Camino Real and Don Jose Correa brand names. I had a chance to ask the owner, Jon van Bilderbeek, a few questions about the company and about the virtues of Colombian leaf. Cigarfan: So how did you discover the merits of Colombian tobacco? Jon Van Bilderbeek: As much as I have been to Colombia I never really paid much attention to the tobacco or the cigars for some reason until I was already very much into the lifestyle of enjoying cigars. I saw that in some of the supermarkets there were smaller cigars in bundles and boxes, maybe two brands at most. But of course these weren’t the premium cigars as until recently premium cigars in Colombia hasn’t quite caught on. So, I decided to try some of these cigars out anyways and sure enough, I liked them. It was something totally different than the usual Dominican, Nicaraguan, or Honduran cigars. They were much smother and mellower but also they just had a very unique flavor profile. This led me to look into the cigars a little more and sure enough just near the city I was living is where the cigars were made. Cigarfan: Colombia has a long history of tobacco production, but until recently there have been few all-Colombian puros available in the American market? Why not? JV: I’m not sure really as to why there have been few Colombian puros in the American market or anywhere else aside from Colombia but it might be that most people just look to the more well known cigar producing countries. I definitely do believe that there is a market in the U.S. for Colombian cigars as well as worldwide. I know that competing with the Cuban cigar market is very difficult but not impossible. For the American market though, I think they are a great change, especially for someone who is looking to try something very different from the hundreds of Nicaraguans or Hondurans, etc. They can also be a good start into the lifestyle of cigar smoking as they are not overpowering yet they are full of flavor and aroma, and even better still is the pricing as we aimed at having affordable high quality cigars. 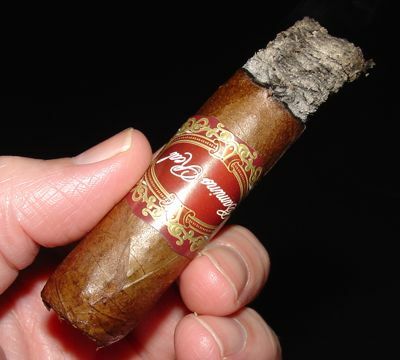 Cigarfan: The Colombian blends I’ve smoked, including Camino Real, are really distinctive, very flavorful, but also quite mild. Most “serious” cigar smokers that I run into are not into mild cigars at all. How do we get these guys to put down their Nicaraguan ligero bombs and appreciate the subtleties of milder smokes? JV: Exactly, Colombian cigars are very unique and everyone that has tried them has said the same. For some reason we just can’t get very strong tobacco without using imported leaf. What I have noticed is that even the guys who only smoke the Nicaraguan ligero have come to enjoy Colombian cigars. It’s a different experience, and I think that Colombian cigars can even complement the ligero cigars. For example, not many will smoke a ligero cigar in the morning. But with Colombian cigars you could wake up, light one up as you make coffee in the morning and you will not have any of those bad feelings, unless you are inhaling the thing… I think really it will mostly come down to people wanting something new, something totally different and not just with a funky name or packaging, or for some the crazy infusions. I mean, how many peoples humidors have just one type of cigar, or even just one brand? Camino Real is produced in two blends, the Cabinet Selection, which bears a red label, and the Series 6, which has a blue label. Both are 100% Colombian tobacco, but the Cabinet uses a blend of Colombian and Cuban seed tobaccos, while the Series 6 uses Colombian, Cuban and Dominican seed leaves. Both have Habano wrappers. Route 45 Cigars was kind enough to send me a sampler pack of their Camino Real line — a couple of Cabinet Series robustos, a couple Series 6 torpedos, and a Series 6 churchill. 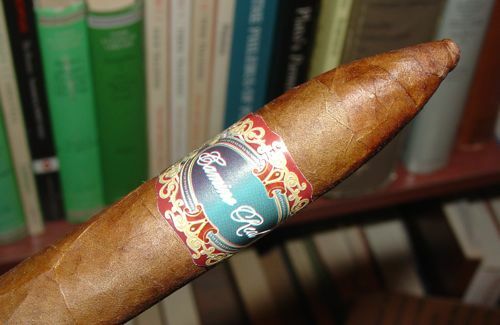 One of the Cabinet Series robustos was rolled too tightly and couldn’t be loosened up; the other one smoked well, but since I really don’t like to review a cigar on one experience, I’m going to concentrate on the Series 6, which I liked better anyway. The wrapper on the Camino Real Series 6 is a fine looking claro leaf with a few prominent veins that are widely and evenly spaced; wrappers from Colombia’s neighbor Ecuador frequently appear this way, so maybe it’s a geographical trait. The wrapper is fairly thin and shows the texture of the binder leaf beneath. The roll is solid and regular, the cap is well formed, and the draw is excellent. The burn is slow, even, and cool. The ash is a little uncivilized — it varies from light gray to almost black; it’s solid but a little flaky. As expected, the Camino Real is smooth and mild. What I didn’t expect was that the smoke texture would be as full as it is; in fact, it’s almost creamy. It starts up with a sweet flavor on the palate, which is also unusual. I had expected a sweet aroma, but the light sugary touch on the tongue is pleasant and sits nicely with a morning cup of coffee. The aroma is fragrant but it isn’t floral the way Connecticut Shade tends to be. It’s lighter and less cloying. The base flavors of the cigar become earthier as the smoke progresses, and the aftertaste grows from nothing at all to slightly woody. There is a suggestion of toast with powdered sugar in the aroma as it drifts from the foot of the cigar. 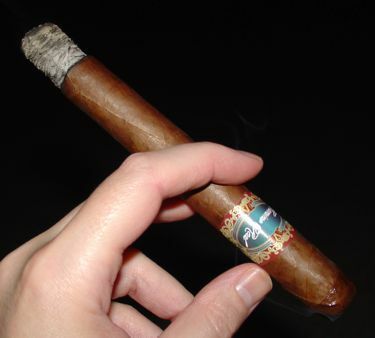 Camino Real is a very distinctive cigar, and I would consider it a serious contender in the featherweight division. Smokers of mild cigars who reach for Macanudo or other lightweight Connecticut Shade smokes should really give this one a shot. I believe its complexity and unusual palette of flavors raises it above the competition in the mild category. While not readily available in stores, five-packs can be purchased from the Route 45 website. The MSRP is around 5 USD, which is extremely reasonable. If you’re up for a walk on the mild side and want out of that old Macanudo-Baccarrat-RP Connecticut rut, I can recommend this Colombian puro for a nice change of pace.